To the moon! To the moon! To the pale-faced moon! I loved Alien Voices' audio production of this tale, so, seeing a recording of their stage performance was a treat from start to finish! If you are a purist when it comes to H.G. Wells, this is probably not going to be your favorite version of his classic story. Artistic license has certainly been taken with it, but I hasten to add that it has not lessened or degraded the original story. They simply mold the material to better suit the medium of radio and to honor the time restraints they had. The storyline: James Cavor, a head-in-the-clouds inventor creates a substance to counteract gravity which he names 'Cavorite'. He and a down-on-his-luck business man, Jeremiah Bedford decide to use it to visit the moon. Each has his own reason; Cavor seeks knowledge and scientific advancement, while Bedford dreams of un-mined jewels and gold. When they finally reach the moon in a metal sphere, they discover an oxygen atmosphere and giant, insect-like, life-forms that turn out to be intelligent. After being captured they are brought before the moon's king, the Grand Lunar. It doesn't take long to see how very different the two cultures are. Okay, so Wells may not have correctly guessed what the moon was like, but it certainly makes for a good story. Performing before an audience and broadcasting live on the Sci-Fi Channel; this production displays a unique behind-the-scenes view of how radio dramas were done is radio's glory days. We are given a rare glimpse of the often over-looked sound (or Foley) artists as they work their magic. I was shocked to see how ordinary objects canbecome such extraordinary tools when in the hands of experts. Even the actors got in on the fun and helped do some of the sound effects! Mr. Nimoy and Mr. de Lancie play the two leads (the scientist, Cavor and business man, Bedford) while Schultz and Phillips took on all the other voices with the exception of the Grand Lunar. It's fascinating to watch them on stage, scripts in hand, no costumes, no gimmicks to hide behind and yet to feel yourself drawn in so completely. It's a testament to the acting skills of all the men that the story is carried so well without the benefit of sets or physical props. 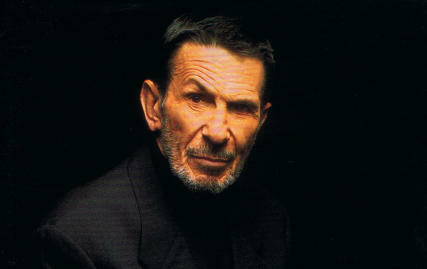 Mr. Nimoy plays the inventor, Cavor, flawlessly. His character's off-hand, absent-minded remarks are very believable and humorous. Of course, Mr. Nimoy's stage presence is undeniable. It's quite clear that he is a man very much in his element. The other actors naturally play to him and he exudes confidence and familiarity as he navigates the techno-babble with the ease of a pro. Which, after all, he is! Mr. de Lancie is all energy and charm as he plays the enterprising opportunist- Bedford. His chemistry with Mr. Nimoy is excellent and his soft voice is a wonderful counterpoint to Mr. Nimoy's deeper, raspier one. While he does have a few small slip-ups with the script, it certainly doesn't detract from his performance and he's a joy to watch. It's no surprise that Dwight Schultz plays multiple characters. Sliding easily from one voice to another, he fades in and out expertly as his characters come and go. When not speaking, he aids the Foley artists with their effects. His Selenite voice sounds fantastic, but looks painful to affect! Prior to the Alien Voices productions, I would have thought Ethan Phillips' voice too distinctive to disguise or change. Yet, he too plays many characters and gives each a unique sound. He also looks completely at home on stage and clearly is enjoying his part in the production. So, what could be better than seeing those four men together on stage? Well, there's only one thing that I can think of and that's adding William Shatner to the mix. As the 'special mystery guest', Mr. Shatner voices the Grand Lunar and is greeted by much applause and excitement. I must admit that, while a firm fan of Mr. Nimoy's beyond Spock roles, it is interesting to watch him playing opposite Mr. Shatner again. Things are particularly interesting when one considers the role-reversal of having Leonard as the human and Bill as the alien. The chemistry that can only be possessed by old friends as well as Mr. Shatner's comical expressions and Grand Lunar voice make his brief appearance a lot of fun to watch. It helps that the actors are clearly enjoying themselves too! So, with a fascinating premise (to revisit old-time radio), a good story and a cast that would melt any sci-fi fan's heart, Alien Voices takes us on man's first voyage to the moon. This was a hugely enjoyable production and I feel very privileged to have been given the opportunity to watch it. My only quibble would be how rushed the story was, especially at the end. However, I'm sure it couldn't be helped. The whole cast gets a standing ovation from me on this one and an extra loud Bravo! goes to the amazing and creative Foley artists.